When visiting, be mindful that Kuwait is a Muslim country practicing Sharia (Islamic law) and that there are cultural differences. Alcohol is not allowed, and it is always wise to dress with respect to the culture. Females don't need to wear a headscarf, but loose-fitting clothing or travel wear is probably a good idea. The most dangerous part of Kuwait is the driving! It has one of the highest road accident rates in the world, so if driving yourself, obtain the appropriate insurance. If hiring a driver or taxi, make sure to call in advance, and if female, do not hail a taxi from the street. The mosque is closed to visitors on Fridays. Kuwait temperatures can reach over 120 °F (49 °C) in the summer, so it’s a better idea to visit from October to May. If planning to travel during Ramadan (an Islamic religious holiday), hundreds of thousands of people come to pray and all aspects of travel are subject to change. If hiring a driver for the day, ask your hotel for recommendations. 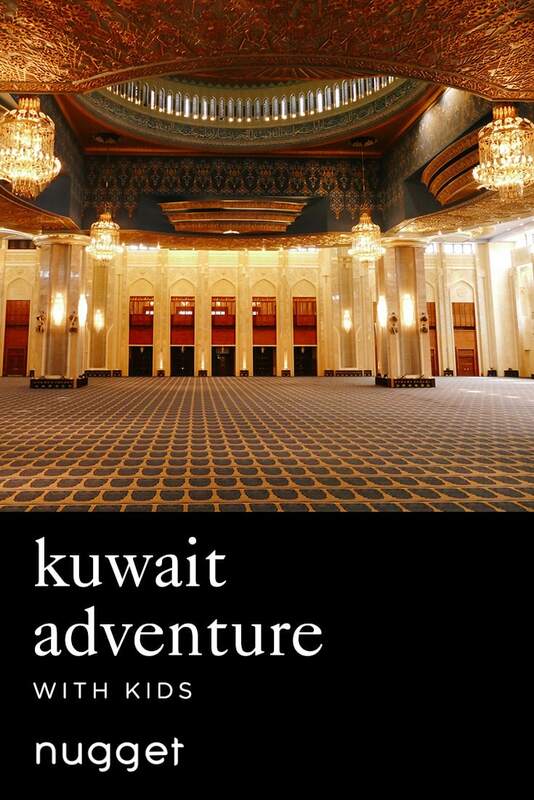 This city adventure in Kuwait with kids is for families who are seeking to get out of their cultural comfort zone. This small, oil-rich country of the Middle East has been quietly developing alongside its glitzier neighbors, Dubai and Qatar, and is still somewhat under the radar. Expect less tourists and a more authentic slice of Arab life during your Kuwait vacation. For older kids, it is a perfect introduction to cultural diversity; and for smaller children, the mosque, beaches and markets are giant playgrounds. Start your city tour at the Grand Mosque, followed by a visit to the bustling central fish market. Stop for lunch on the harbor at the Marina Crescent shopping district and then take a short beach walk. Head downtown to explore the urban green project of Al-Shaheed Park. End your Middle East family trip adventure with dinner and a stroll through the Old Souq (the marketplace). Start your family's Kuwait vacation at the city's largest and most spectacular mosque. Free tours are available every day except Friday, at 9:00 a.m. or 5:00 p.m. and last about 1.5 hours. The building is over 20,000 square meters (over 215,000 square feet) and can house 10,000 men in the main hall and 1,000 women upstairs in the smaller hall. The carpeted floors and colorful prayer nooks are fun for your children to explore while learning about Kuwait's religious history. DIRECTIONS The Grand Mosque is in the center of the city, opposite of Al Seif Palace and the Stock Exchange, on Arabian Gulf Street. There is a security guard inside the entrance booth at the side of the mosque. He will tell you where to park and lead you in. TIP Women are given abayas (tradition Muslim women clothing) and headscarves on arrival. Refreshments are served before the tour. Before the discovery of oil, Kuwaitis were Bedouin seafarers. The fish market is a wonderful glimpse into the country's ancient trade and passion during your Middle East family vacation. Kids can run around the bustling floor, watch fisherman unload their catch onto the docks and sample delicious, dried, regional fruits from the bevy of vendors. DIRECTIONS The fish market is less than a kilometer (0.6 miles) up Arabian Gulf Street. Turn left into the large parking lot. The Marina Crescent area is a waterfront shopping district with a host of cafés, restaurants and shops. With everything from "Western" options like Le Pain Quotidien and Starbucks to more regional Persian and Middle Eastern fare, it's a perfect place to have a bite and watch the boats come in and out of the harbor. There are also a few kiosks selling harbor cruises if you want to do a boat cruise during your Kuwait vacation. DIRECTIONS Follow the coastal route of Arabian Gulf Street (also called the Corniche) east to Salmiya, where you will see the Scientific Center. There is ample parking all along the Marina Crescent shopping district and by the water. The Corniche walkway from the Marina Crescent shopping district to the Scientific Center is a lovely stretch to walk and take part in Kuwaiti beach culture. There are small play areas, skating ramps and grassy sections of beach for kids to explore. Depending on the time of year and the heat, it is also stroller-friendly for an afternoon nap for tired toddlers. There is also a spinning climbing triangle, climbing wall and children's creek on the seaside, across from the Amro Bin Al Aas Street junction. DIRECTIONS From the Marina Crescent shopping district, walk east along the walkway, towards the Scientific Center. Al-Shaheed Park is an urban green space in the center of the city: 200,000 square meters (124 square miles) of contemporary landscape design, meandering park walks, and museums, cafés and one of the best views of the city's skyscrapers. Try out the iron-clad coffee at Three & Barista while your children play with local families on the green areas. A rejuvenating pre-souq (before going to the marketplace) activity and completely modern take on how Kuwait envisions its future. DIRECTIONS Drive west to downtown Kuwait City on the Corniche/Arabian Gulf Street/Route 25 toward Hamad Al-Mubarak Street. Make a left onto Abdulla Ali Al Mutawa Street/Route 3. Take the ramp onto Issa Bin Salman Al Khalifa Street/Route 30. Take a left on the 1 /First Ring Road (this junction is complicated, so keep your eyes peeled for signs). Follow First Ring Road. Turn right onto Cairo Street/Route 35 around the Memorial Museum, and an immediate right onto Soor Street. The park is on your right, and there is an underground parking lot. TIP For older kids, there is a natural history museum on-site introducing you to the plants and animals of the desert. The tour includes an audio device with different language settings. Souqs (the marketplaces) in the Middle East are always the liveliest part of the city experience. It is also one of the best opportunities to interact with local families who are out for dinner and an evening stroll. Kuwait is still quite undiscovered, so the old Souq Al-Mubarakiya (Al-Mubarakiya Marketplace) is still an authentic slice of Arab life. For children, there is a large water fountain and playground next to the food market. DIRECTIONS Take Soor Street north, turn left onto Khalid Ibn Al Waleed Street, follow for about 1 km (0.6 miles). At the roundabout, take the 2nd exit and stay on Khalid Ibn Al Waleed Street. Drive for 3/4 km (0.5 miles), and at the roundabout, take the 2nd exit onto Ahmad Al Jaber Street. Turn right onto Mubarak Al Kabeer Street, then left onto Oman Street, a slight right onto Saud Bin Abdulaziz Street. Park in the Al-Souq underground parking lot.